A large tree with a narrow crown, it can grow to 40 metres tall and 1 metre in diameter when mature. Needles are four-sided, sharp, and stiff, and are arranged spirally on the twigs; whitish-green and foul smelling when young, they become pleasant smelling with age. 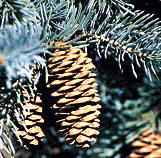 Seed cones are light brown to purplish and hang from the upper branches. The seed scales have a smooth, rounded outer edge. Pollen cones are pale red. 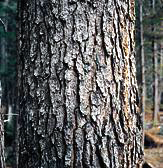 The bark is loose, scaly, and greyish-brown. White spruce and its hybrids are found through-out the Interior from valley floor to mid elevations. 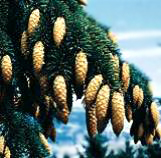 In the central Interior, white spruce interbreeds with Engelmann spruce and is referred to as interior spruce. The pure species is generally found only north of Dawson Creek. White spruce grows in a wide range of environments. 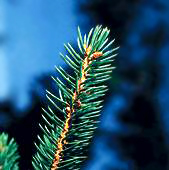 It frequently grows with lodgepole pine, subalpine fir, aspen, birch, and willow. Oak fern, horsetail, and gooseberry often grow under white spruce. Lynx, snowshoe hares, wolves, and moose live in these northern forests. Aboriginal people living in the Interior used most parts of the white spruce tree. They made spruce saplings into snowshoe frames and sometimes into bows. They heated the gum to make a glue to fasten skins onto bows and arrowheads onto shafts. They used the decayed wood for tanning hides. Spruce bark was also used to make cooking pots and trays for gathering berries. 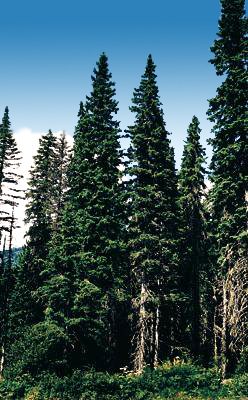 White spruce is a very important commercial tree species, yielding excellent lumber and pulp. 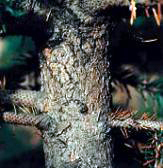 White spruce is often shallow- rooted and susceptible to being blown over, especially on thin or wet soils. Large areas of blown down spruce are prime breeding sites for the spruce beetle, which can then spread to mature trees and kill thousands of hectares of old-growth spruce.